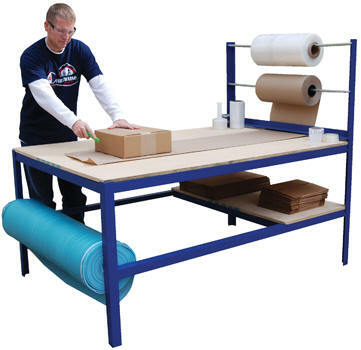 Multi-purpose work bench is great for all your packaging needs! Wooden surface is durable and soft so it will not damage your products. Includes elevated tower for holding two rolls of packaging paper or bubble wrap. Maximum roll width is 44". Maximum roll diameter is 20". Height of the three roll axles are 59", 47" and 16". Extra roll of material may be stored under table. Lower storage shelf for holding boxes, tape, tools and other items. Steel construction with blue painted finish. Wood Particle Board top is ¾ (in.) thick.